property listed for sale at auction or by private sale. The "reserve"
report is provided on lots who's low estimate is less than $500. certificate certifying measurements and weight. rights of copyright or reproduction in, to or of the Property. recognize any person without a bidder's paddle. Auctioneer, prior to any bid being accepted for the lot. taxes and export of the Property. price, and 15% on any portion of the price which exceeds $100,000. of all charges had been paid, unless otherwise agreed by us in writing. mail, please insure that the sale number is written on the check. by third parties will not be accepted. must be presented when collecting purchases. reasonable costs associated with storage of the Property. for, are recommended or furnished only as a courtesy to the buyer. result in loss of or damage to Property. Export and Import Matters. An export license issued by the U.S.
laws and to obtain any necessary export and import licenses. and on any resale), and reasonable attorneys' fees and expenses. property to buyer or buyer's agent. excluding the buyer's premium. "Buy" bids will not be accepted. possible price permitted against other bidders and the reserve. private sale by us of Property. expect as specifically stated above. linkauctiongalleries.com. Our website is www.linkauctiongalleries. Conditions appearing in this catalogue. emeralds to retain optimum clarity. weeks before the auction date) and are at the client's cost (prepaid). gemstones may have been enhanced. as precise indications of size. Description: English design two member breakfront china cabinet having four glazed doors above four cupboard doors. Description: Councill Co set of eight mahogany dining chairs comprising two armchairs and six side chairs, each having reticulated splats on Marlborough legs. Description: Hitchcock design ladder back chair with gilt highlights. Description: Pair of modern parlour armchairs with silver and black zig zag design upholstery. Description: Shaw Walker Five piece three stack metal lawyers bookcase. Description: Framed 1960's paper dress titled, "Flower Fantasy." Description: Framed mezzotint of calla lilies titled, "Calla Lilies and Plum" by Sherie Wolf. Description: Framed German dressage poster. Description: Framed picture of the future home of the Cahokia race track. Description: Framed engraving titled "Low Tide." Description: Framed oil on canvas depicting a landscape scene with a lake, artist signed Harris. 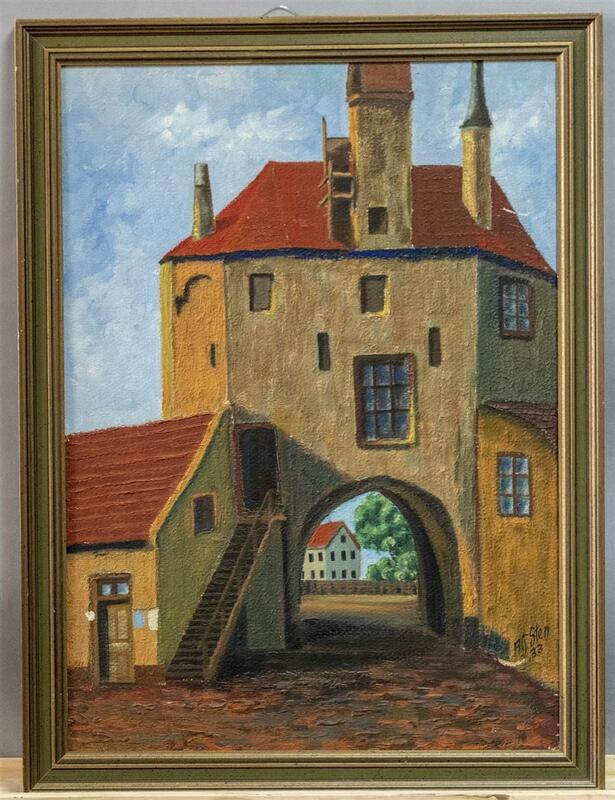 Description: Framed oil painting on board, artist signed and dated, depicting a house featuring an arch drive through. Description: Framed etching by Carel featuring two Dutch girls with their dolls. Description: Pair of brass pricket stick lamps. Description: Collection of four items including a soapstone sculpture titled "Two Chain Links", two unmarked pottery vases, and a polished geode on stand. Description: Two carved wooden African figures and a lidded basket. Description: Red painted Chinese food container. Description: Glazed pottery vase (height: 20 inches). Description: Seven hand painted porcelain items stamped Czechoslovakia including a tea pot, vases, a small pitcher, with underplate, and more. Description: Three piece coffee and tea service, gold finish.